LAUSANNE, Switzerland — The World Baseball Softball Confederation (WBSC) today unveiled baseball and softball’s first-ever dedicated world rankings web platform at http://rankings.wbsc.org. 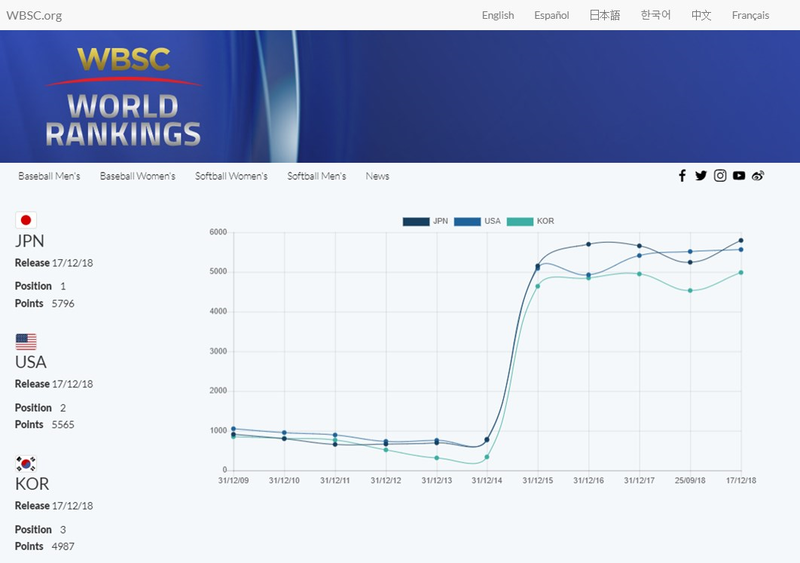 The new WBSC World Rankings website features robust functions such as tracking, trends, top climbers, charts, country-by-country comparisons, ranking by continent, points earned by each National Team/Federation per competition, methodology, and a world rankings news section in six languages — English, French, Japan, Korean, Spanish and Traditional Chinese. WBSC President Riccardo Fraccari said:“Today marks a major milestone, as the baseball and softball world rankings web platform is now amongst the biggest of any sport.“WBSC is proud to unveil this new innovative service for the worldwide baseball-softball community and all WBSC’s Members who have been requesting this.“On the commercial sWBSC oversees and manages baseball’s and softball’s official world rankings across four disciplines — men’s and women’s baseball, and men’s and women’s softball — and across 135 countries and territories. Tracking of the WBSC World Rankings is available dating back to the inception of the Baseball World Rankings in 2009 and the launch of the Softball World Rankings in 2016. With the launch of the new web platform, WBSC also released the final 2018 rankings in men’s baseball and women’s softball.